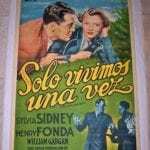 YREDUCED 60$ YOU ONLY LIVE ONCE ’37 LB ARG 1 SH FONDA & SYDNEY ~ DIR FRITZ LANG! 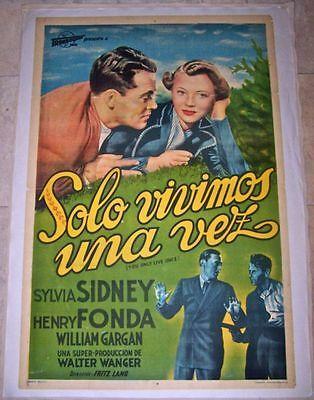 Size: Original Argentinean One Sheet (29” x 43″). Condition: Linen-backed. Fold line & crossfold touch-ups, various areas of border chipping and small paper loss, fold-lines visible, rich color and romantic artwork. Overall displays in Good to Very Good Condition. Please refer to the attached image and enlarge for a detailed view of this Linen-backed One Sheet for the 1937 Fritz Lang tale loosely based on the legend of Bonnie & Clyde, YOU ONLY LIVE ONCE. And Don’t Forget, Always Feel Free To Make An Offer On Any Of Our Items! 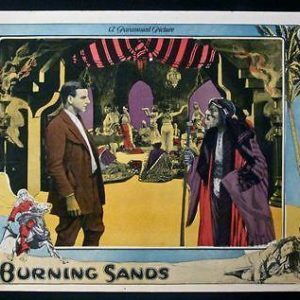 We will be adding new items daily including great titles featuring John Wayne, Buck Jones, Orson Welles, Karloff, Steve McQueen, Humphrey Bogart, Marlene Dietrich, Clint Eastwood, Bette Davis, Horror, Film Noir, Western, Beach and Bikini, and Jungle Movie Posters. Thanks for looking and Good Luck! Every Thursday evening AAAVINTAGEMOVIEPOSTERS will be listing over 1,000 of some of the most highly sought-after and valuable Film Noir Title Cards, Scene Cards and full Lobby Card Sets ~ All in Very Fine to Mint Condition! You’ll want to make it a habit to check our Film Noir Thursday listings which will include hundreds of very desirable and Very Fine to Mint Condition Title and Scene Cards from such Film Noir Classics as CASABLANCA; THE MALTESE FALCON; TREASURE OF THE SIERRA MADRE; DOUBLE INDEMNITY; OUT OF THE PAST; THE THIRD MAN; JOURNEY INTO FEAR; THIS GUN FOR HIRE; MURDER, MY SWEET; KISS ME DEADLY; KEY LARGO; DARK PASSAGE; SCARLET STREET; SUNSET BOULEVARD; THE WOMAN IN THE WINDOW; BRUTE FORCE; THE NAKED CITY; THEY DRIVE BY NIGHT; THE DARK CORNER; SORRY, WRONG NUMBER; ACE IN THE HOLE; THE BLUE DAHLIA; THE BIG SLEEP; BODYGUARD; CORNERED; CROSSFIRE; CRY DANGER; CRY OF THE CITY; DEAD RECKONING; THE KILLERS; THE KILLING; JOHNNY O’CLOCK; T-MEN; NIGHTMARE ALLEY; LAURA; THE KENNEL MURDER CASE; GREEN FOR DANGER and D.O.A only to name a few. We will also be listing rare Title and Scene Cards from 10 CHARLIE CHAN titles including CHARLIE CHAN AT THE RACETRACK; CHARLIE CHAN IN PANAMA; CHARLIE CHAN ON BROADWAY; CHARLIE CHAN IN RENO and CHARLIE CHAN SHADOW OVER CHINATOWN as well as some of the most coveted SHERLOCK HOLMES Title and Scene Cards from some of the hardest to find titles including HOUSE OF FEAR; DRESSED TO KILL; THE SCARLET CLAW; THE PEARL OF DEATH; CURSE OF THE SPIDER WOMAN and THE WOMAN IN GREEN. Don’t miss this rare chance to acquire these coveted Title Cards, Scene Cards and full Lobby Card Sets from some of the hardest to find Film Noir titles, and all in incredibly amazing condition! 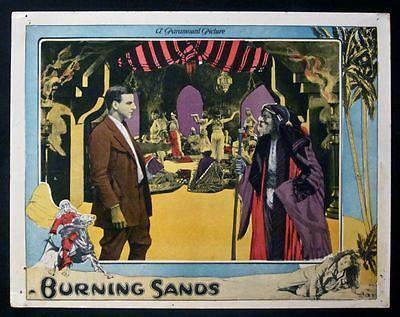 Feel free to contact us about upcoming AAAVINTAGEMOVIEPOSTERS weekly Ebay listings. CUT 50! MEET JOHN DOE R45 NEVER FOLDED 1/2 SH! STANWYCK COOPER! CAPRA CLASSIC!